More info at the screenshot. 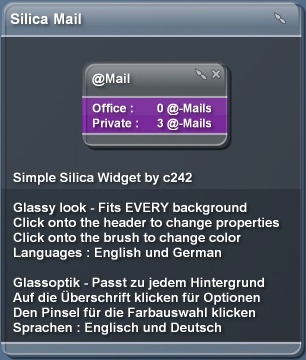 Simple Widget based on the great Silica widgets that come with DesktopX. More to come. Thanks - Finally a very nice Mailchecker! Is there a chance for future versions to integrate - open mail client when clicking on the received mail message or even a small preview window? Just think how you configured your mail program. I don't know how to solve a problem: it always says I have a hudge bunch of new emails, although everything has been read or at least marked as read... It is the same with every mail checker stuff I tried so far !! I am using thunderbird, it is a pop3 account. What am I doing wroung ????? HELP, pls !?!? The script/the plugin can't differ between read and unread mails. The only possible solution would be to move the read mails to another folder on the server. have 4 pop3 accounts so glad to see your making an extended version of this widget. I feel like a moron asking this, but like the other person said, I can't figure out what to put where. I've never done anything like Outlook before, so I have no experience with these things. I've only done the simple user name and password fields. Another stupid question, is Hotmail and Yahoo Mail pop3? right click on where it says how many emails you have, then click set target. go to your services web page and look around in their help sections, thats a good place to find the pop info. The plugin doesn't work with mail-accounts that leave the e-mails on the server as it can't make a difference between read and unread mails. i have a few problems with some widgets..
system is winxp sp2...with all latest updates. athlonXP3200+, ati 9800pro. Try to right-click on the widget and click "properties" instead. Does that work ? Do other widgets work ?